RVMG will hold our third annual math contest on 3/24/2019, again co-sponsored by Storming Robots. Follow this link for more information, or to register for the event. 2018-19 HMMT will be held on Nov. 10, 2018 and Feb. 16, 2019 at Harvard and MIT, respectively. RVMG will send two teams, RVMT-Newton and RVMT-Ramanujan, to the November event. RVMT-Euler team will participate in the February event. Best of luck to the 20 mathletes on the three teams! All registered contestants will receive campus directions to the Test with your registration confirmation. Prizes awarded to top high school and top middle school contestants. Must be pre-college students. Students are recommended to have high proficiency in Algebra 1. View F.A.Q. for more information. If it does not answer your concern/question, please Email us. Sudoku challenge, chess challenge, robotics demo, etc. Some activites will have prizes. We anticipate all will be highly engaging. 12:30 to 1:00PM | Open Forum : Discussion on Possible Solutions to Test Questions. Registration Cost: $35 per contestant. To reserve a seat: Register online here . Please note that registration is not complete until payment is received. You will receive an official confirmation from us along with a campus direction map after registration is complete. Pre-registration is required. No walk-ins will be accepted. Lunch (Students have the option to purchase at check-in time, or bring their own). Please do arrive no later than 9:45am to allow students to select lunch and fun activities following the test. Activities, Lunch, and Last hour Open forum are all optional. 2 weeks prior to 3/17 : full – $10. 1 week prior to 3/17 : 50% – $10. 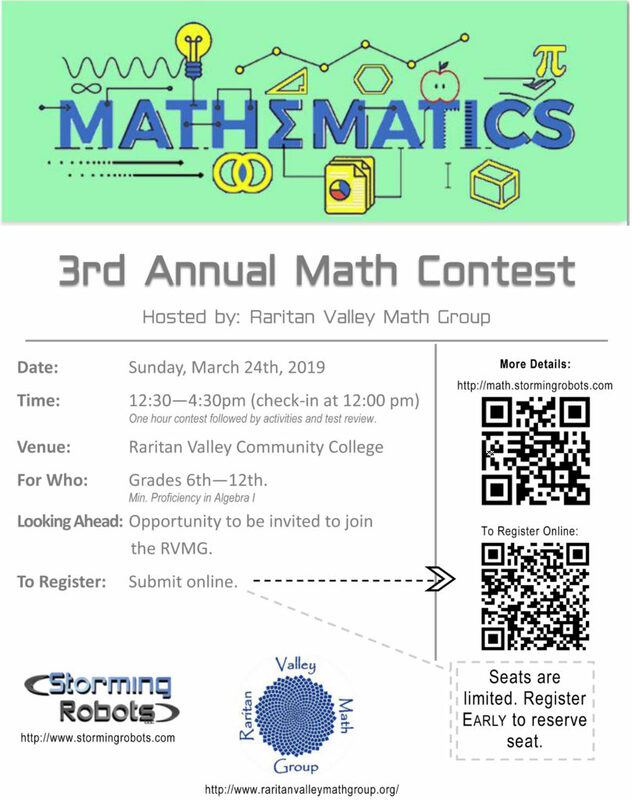 Please click on over to the Contest Questions & Solutions page to see the Questions/Solutions for the First Annual Raritan Valley Math Group Math Contest held at Storming Robots on March 18, 2017. First Annual RVMG Math Contest a Success! Congratulations to all middle and high school students from across New Jersey who joined us for our First Annual Raritan Valley Math Group Math Contest held at Storming Robots on Saturday, March 18, 2017. The participants did very well. Following the contest, fun was had by all as participants played Speed Chess, with assistance from Dean of Chess, puzzled away in a Sudoku tournament, and enjoyed presentations by current Storming Robots students regarding Artifical Intelligence/Algorithms and Spider Bots. First Place High School: Rishubh T.
Second Place High School: Angelica C.
First Place Middle School: Adithya B. Second Place Middle School: Aneesh D.
Top Female Scorer: Angelica C.
Speed Chess Champion: Angelica C.
Questions and answers from the contest will be posted soon. Watch for them! Hope to see YOU next spring! 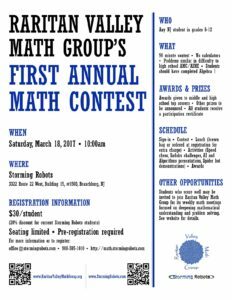 In collaboration with Storming Robots, Raritan Valley Math Group (RVMG) will host its First Annual Raritan Valley Math Group Math Contest on Saturday, March 18, 2017 beginning at 10:00 am at Storming Robots in Branchburg, NJ. The contest is open to any New Jersey student enrolled in grades 6-12. Homeschoolers are also welcome. The contest will be 90 minutes long, with no calculator use permitted. Problems will be similar in difficulty to those found on the high school level AMC and AIME math contests. At a minimum, students should have completed Algebra 1. Following the assessment there will be a break for lunch (students may bring their own or pre-order at registration from a variety of Italian options, including pizza, for an additional fee) followed by a choice of activities including speed chess, Sudoku challenges, AI and Algorithms presentations, and spider bot demonstrations. The contest ends with an awards ceremony where the top middle and high school scorers will be given special prizes. All students will receive a participation certificate. Students who score very well on the contest may be invited to join RVMG for its weekly math meetings. RVMG’s meetings explore areas of math that are beyond the typical scope of the public school sequence with the purpose of deepening mathematical understanding and problem solving. In addition, a subset of RMVG students, the Raritan Valley Math Team (RVMT), attends national math competitions, including the American Regions Mathematics League (ARML), Harvard-MIT Mathematics Tournament (HMMT), and Princeton University Mathematics Competition (PUMaC). In November 2016, RVMT finished in eighth place overall (out of 146 teams) and received sixth place in the team round at HMMT. Pre-registration is required as seats are limited. Registration is $30 per student. Current Storming Robots members save 20% off registration. For more information or to register, visit http://math.stormingrobots.com, email office@stormingrobots.com, or call 908-595-1010.